The Surf Golf & Beach Club is one of the oldest Myrtle Beach golf courses on the Grand Strand. Designed by renowned golf course architect, George Cobb, the Surf Club has been a favorite for more than 50 years. The Surf Club is a traditional parkland style layout that is both challenging and fun and will entertain golfers of all skill levels. 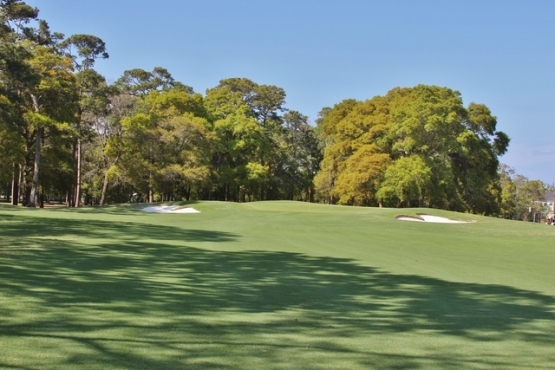 The fairways wind through towering Carolina pines and beautiful old oak trees to create a wonderful day on the links. Water hazards and strategic bunkering will challenge even the most expert players. The wonderfully maintained Bent grass greens are a joy to putt on as they offer a true roll on every putt. The 10th hole is a great par-5 that everyone needs to experience to appreciate its uniqueness. The Surf Golf & Beach Club has a wonderful practice facility featuring a grass driving range and putting green. The service at the Surf Club is top-notch from when you arrive at the bag drop, check in at the fully stocked pro shop and enjoy lunch or a beverage in the beautiful clubhouse. Myrtle Beach Golf Authority is proud that it can offer the Surf Golf & Beach Club with its Myrtle Beach golf packages. The Surf Club is located in the heart of North Myrtle Beach, which makes it very convenient to enjoy the Beautiful North Myrtle Beach accommodations offered by Myrtle Beach Golf Authority. North Myrtle Beach has many golf practice ranges where you can get the best in a Myrtle Beach golf lesson from a premier Myrtle Beach golf instructor. It is time to book a Myrtle Beach golf package and build some memories that will last a lifetime! I played the Surf Club this past Sunday and it was in great condition as usual. I love the bent grass greens because they always roll so smooth. Great job Surf Club. Very good, interesting hole layouts, lots of doglegs, former private club, fun greens, very close to Elliott.